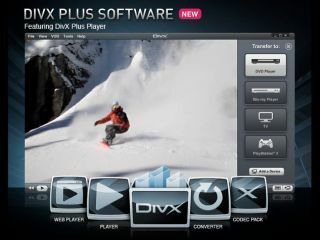 DivX released its new updated software package this week, with DivX Plus offering a whole host of features for those who want easier sharing and playing of their media files. Speaking to TechRadar, Ryan Taylor, Product Marketing Manager, Consumer Software and Services, revealed the company's inspirations for the streamlined approach it has taken with the software package, name-checking Google in the process. "We certainly took a page out of Google's approach to Chrome," explained Taylor. "That browser was so revolutionary in the way that it changed [the way] you thought a normal browser should look. "So, we have given the DivX player some space and simplified it." The new DivX Plus Player does offer some impressive new easy-to-use features, such as smooth fast-forward and rewinding and the automatic addition of chapter marks to files which have none. Taylor hopes that the player's new Google-inspired look will tempt new users into using DivX's services. "We've completely redesigned every product in the line," notes Taylor. "We wanted DivX to be paired back to its primary uses." Perhaps the best feature, however, is the automatic conversion tool in-built into the player. Called DivX To Go, you just drop your file into it and it will be converted to a friendly codec which can be used on your Blu-ray player, DVD player, TV and PlayStation 3. Unfortunately, you will still have to transfer the file to a USB but there is talk of adding streaming capabilities to the software. "We don't want to talk about DivX To Go as a converter, but something which makes the transferring of files easier," said Taylor. "There isn't network functionality at the moment but what you get for free is basic transcoding support which still retains the quality of the file." While DivX partners Google in offering its web player to be compatible with Chrome, when Google's proposed TV service was mentioned, Taylor didn't seem to be aware of what was going on but was happy to divulge a bit about DivX's own web television platform DivX TV. "We have our own DivX TV service coming out in the UK this year on LG's TVs but I don't know what Google's plans are. "You should see DivX TV, though, in the US at least by Christmas."